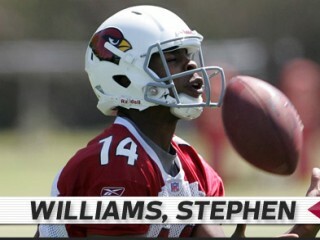 Stephen Williams is an American football wide receiver for the Arizona Cardinals of the National Football League. He was signed by the Cardinals as an undrafted free agent in 2010. He played college football at Toledo. Started 40 of 46 career games … became Toledo’s all-time leader with 229 receptions and 3,102 yards, breaking records held by current New Orleans WR Lance Moore (2001-04) … averaged 13.5 yards per catch for his career and totaled 23 TDs … as a senior, started all 12 games for the third consecutive season, totaling 1,065 yards and seven TDs on a career-high 79 receptions … named first-team All-MAC ... finished 19th in the nation and fourth in the conference with 6.6 receptions per game … ended up 17th in the country and third in the league with 88.8 receiving yards per game ... registered 10 receptions for a career-high 231 receiving yards and two TDs vs. Ball State, including a 51-yard game-winner with 27 seconds left ... totaled 185 yards receiving, two TD receptions and tied career-best in receptions (15) @ Purdue ... started all 12 games played as a junior, earning second-team All-MAC honors for the second consecutive season ... finished sixth in the conference with 71 receptions for 781 yards and a career-best eight TDs ... totaled a season-high 12 receptions vs. Arizona, the second-highest total of his career ... recorded two TD receptions vs. Eastern Michigan … named second-team All-MAC as a sophomore after finishing seventh in the conference with 73 receptions ... ranked second in the MAC by averaging 97.4 yards per game ... became only the fourth receiver in Toledo history to gain more than 1,000 yards receiving ... totaled 1,169 yards to rank third all-time in school history, just 25 yards shy of Moore’s record of 1,194 yards set in 2003 ... tied Moore’s school record for receptions in a game with 15 for 172 yards vs. Buffalo (10/13/07); the second-most in the nation in 2007 ... had six games with at least 100 yards receiving ... totaled 150 yards and two TDs vs. Eastern Michigan (11/3/07) … in 2006, started four of 10 games played as a freshman, recording six receptions for 87 yards and one TD … redshirted as a freshman in 2005. Full name Stephen Jacob Williams … named all-district and all-area as a senior at Marshall High School (Houston, TX) … recorded 39 receptions for 835 yards and seven TDs … timed at 10.7 in the 100 meters as a junior … jumped 6-4 in the high jump and 22-11 in the long jump … majored in Communications. View the full website biography of Stephen Williams.